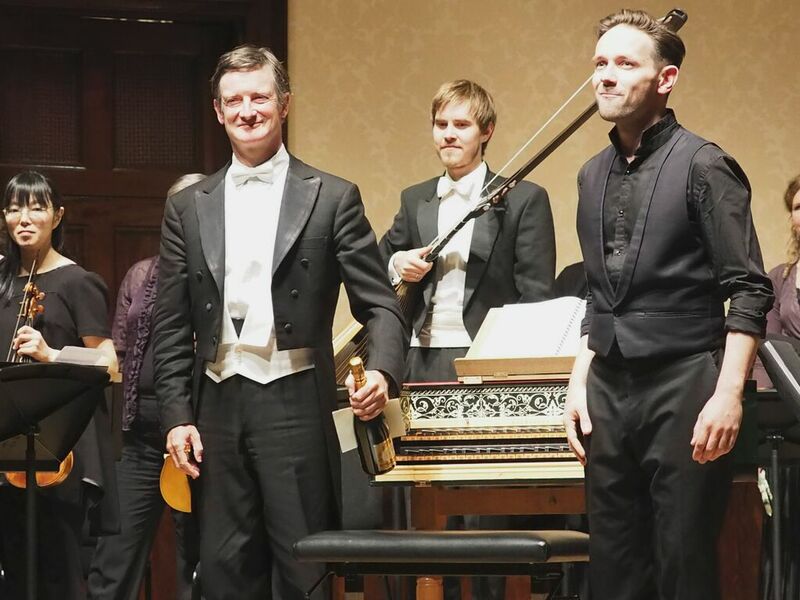 Last night (Saturday 12 September 2015), the Wigmore Hall's 2015/16 season opened with counter-tenor Iestyn Davies performing a generous selection of Handel arias accompanied by Harry Bicket and the English Concert (leader Nadia Ziener). There was an overture and arias from Handel's Partenope, arias from Rinaldo, Rodelinda and Orlando, with the Passacaille from Radamisto, plus Veracini's Overture No. 2 in F and Porpora's Sinfonia da camera in G Op.2 No. 1. In many ways, the concert was something of a retrospective of roles Iestyn Davies has performed recently in the UK with an anticipation of one to come, as Davies sang in the 2014 revival of Glyndebourne's production of Rinaldo (see my review), in ENO's 2014 production of Rodelinda (see my review) and will be singing the title role in Handel's Orlando at the Barbican. We started with Handel's Partenope, a slightly satirical piece written in 1729 which mixed elements which approach comedy with a serious purpose. The English Concert under Harry Bicket made a surprisingly full sound with 17 players on stage. The opening of the overture had a nice bounce to the stately rhythms, whilst the perky triple time section was very toe-tapping. Iestyn Davies sang three of Arsace's arias, arranged not by where they come in the plot but simply to make a satisfying grouping. 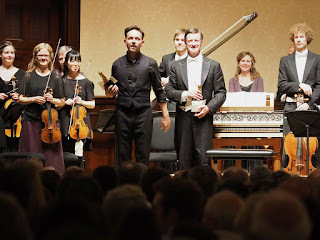 In a hall the size of the Wigmore Hall and with such a sympathetically responsive acoustic, the was no need for Iestyn Davies to push his voice, and there were many moments where the simple beauty of the way the tone emerged and then floated over the orchestra was breathtaking. He sang everything from memory, and each aria in the programme was given a highly characterful delivery, involving the audience in the drama. The group from Partenope began with Sento amor (Love unrelenting) which was sung with a great beauty of tone and line, with a nice evenness. There was also a lovely sense of dialogue with the orchestra. Chi'io parta (And must I) had an A section which started almost like an accompagnato, a rather neat device to trick the audience, but the aria was a serious one and highly effective, particularly with the contrast to the lyrical B section where Iestyn Davies slimmed his tone down to a finely elegant thread. 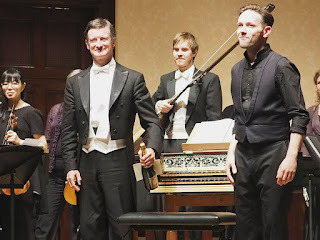 Finally in this group, Furibondo spira il vento (The furious blast), in which Iestyn Davies gave us the preceding recitative, followed by the vigorous orchestral introduction and then Davies himself with spectacular passage-work. The tempo took no prisoners, and Iestyn Davies displayed great ease and a wonderful evenness in the divisions, and it was characterful too! Francesco Maria Veracini (1690-1768) was a violinist/composer who made extensive visits to England. He played his own music in the intervals of Handel's operas and his Overture No. 2 in F (1716) is one such. The work starts with a classic overture (slow/fast/slow/fast) in which stately crisp rhythms altenated with perkier sections. Then came a sequence of dance movements one of whose distinctive features seemed to be that they used multiple trio sections. The Gavotte was crisp and lively, the Sarabande graceful with a moving bass, and the Menuett and Gigue robust. What else was noticeable was the imaginative way Veracini wrote for the strings, particularly in the trio sections of the Gavotte and the Menuett. We finished part one with a pair of arias from Handel's first opera for London, Rinaldo. Cara sposa (My dear beloved) was movingly poignant, with a richly textured, strong tones from the orchestra. Iestyn Davies sang with a finely even long line which contrasted with the busier, questioning strings and a vividly busy B section. 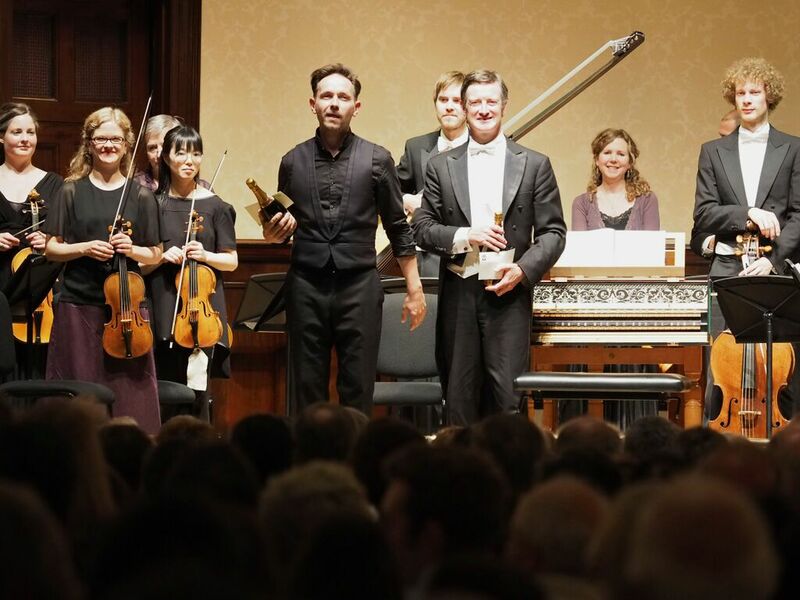 Venti turbini (Winds, gales) is a spectacular show-piece give superbly with crisply vigorous strings accompanying Iestyn Davies masterful passage-work. The second half opened in quieter mode with the accompagnato Pompe vane di morte! (The hollow splendour of Death) and aria Dove sei (Where are you) from Handel's Rodelinda which he wrote for London in 1725. 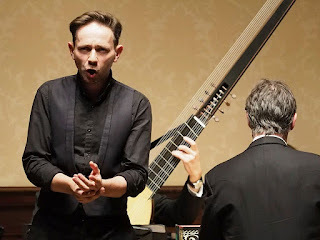 The accompagnato was strong stuff, with Iestyn Davies bringing out the words, and the way aria and recitative overlap is lovely. The aria is relatively simple, and Iestyn Davies did not attempt to do too much, leaving music and artistry to speak for themselves. Nicola Porpora (1686-1768) was one of the composer brought to London by the Royal Academy to write operas as well as Handel. His Sinfonia da camera in G Op.2 No.1 is from a group published in 1736, it is for two violins and continuo here played by Nadia Zwiener and Alice Evans (violins), Joseph Crouch (cello), Jorgen Skogmo (theorbo) and Harry Bicket (harpsichord). This was graceful chamber music full of sensibility. An opening Adagio saw the two violins intertwining elegantly, followed by a brisk Allegro, with a stately flowing and elegant final movement. Finally a sequence of arias from Handel's Orlando which he wrote for London in 1733, it was the last opera which the great castrato Senesino was to sing for Handel. Perhaps the mad scene was a step too far. Iestyn Davies, Harry Bicket and the English Concert started with the mad scene which concludes act two. This is a remarkable sequence of accompagnato, recitative and short, da capo-less arias, including a short passage in 5/8, in which Handel depicts the sudden capricious nature of Orlando's madness. It is tricky to bring off in concert, but was vividly performed with Iestyn Davies giving us some brilliant sudden turns of mood. Before the final two arias from Orlando, the orchestra played the Passacaille from Radamisto (1720), a lovely passacaglia which was given with a lovely swing to the rhythm. Fammi combattere (Go bid me fight) was wonderfully done, combining the firmly martial with some fine passagework. Then the recitative Gia per la man d'Orlando Now by Orlando's hand) followed by the aria Gia l'ebro mio ciglo (Drugged by this sweet liquid). The recitative was very striking, with accompaniment from just two violas and bass, the two violas lines richly busy and characterful, matched by Iestyn Davies strong delivery of the recitative, this continued into the aria where the simple vocal line (a lullaby effectively) contrasted with the wonderfully rich vocal lines. 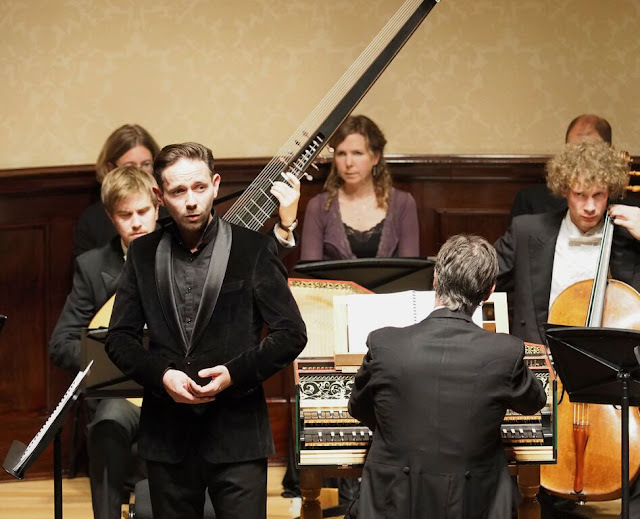 After an enthusiastic reception from the audience were were treated to an encore, David's O Lord, whose mercies are numberless from Handel's Saul which Iestyn Davies is performing at Glyndebourne this year.